Sore gums can occur in one area of your mouth or throughout the entire mouth and have a various number of causes. Your gums may be sore when you brush and floss them, or they may be sore throughout the day, causing chronic pain. The soreness is related to infection, swelling, and inflammation of the gums and is simply a symptom of an underlying condition. Your body’s natural reaction to plaque bacteria in the mouth is swollen gums, which causes them to become sore. Bacteria and gum infections like gum disease are the number one cause of sore gums. 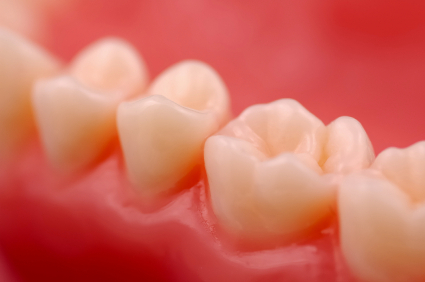 When plaque sits on the teeth for around 24 hours, it calcifies into tartar. Tartar cannot be brushed off and harbors bacteria that cause gingivitis, resulting in sore gums around the areas of buildup. Areas between teeth that abnormally collect food are especially prone to being sore, due to the constant packing each time you eat. Old fillings or crowns can allow bacteria to cling along the margins or seep into areas that are no longer protected, resulting in localized sore areas along the gums of these teeth. Even skipping part of your oral care routine from time to time can allow tissue to become irritated from a buildup of bacteria. You should floss at least once per day and brush twice each day to prevent sore gums. Occasionally there may be ingredients in toothpaste or oral care products that cause allergic reactions in the mouth. An example is sodium lauryl sulfate (SLS), which can cause tissue sloughing. Older or improperly-fitting dental appliances such as retainers, partial dentures or dentures can cause rubbing against oral tissues, creating irritation and soreness throughout the mouth. Gums that produce a pimple like sores are related to dental abscesses from extensive decay. Erupting teeth cause sore gums in children – and even in adults. Wisdom teeth may not be fully formed until close to age 30. Sore, swollen and sensitive gums are symptoms of gum disease. Sensitive teeth and gums are often due to the buildup of bacteria along the margin of your gums. A sore mouth and gums is a signal to you that there is a condition going on in your mouth that needs your attention. Sore teeth can even become mobile or fall out if the infection is severe enough. Even if you have sore gums and tongue, it’s important to take action early on that may be uncomfortable at first to help eliminate the infection. Apply just enough pressure to make the tissue blanch – no more, no less. 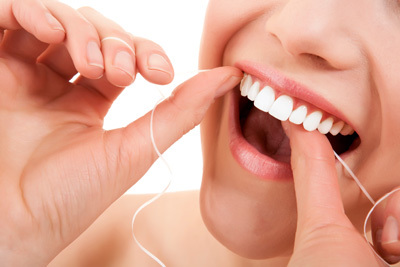 Floss daily by wrapping the floss tightly around each tooth and sliding up and down under the gums as far as it will go. This is usually two or three millimeters. Have your teeth cleaned regularly at the dentist to prevent excess tartar buildup. The remedies for sore gums are relatively simple and straightforward. Even dental professionals will stress that to treat sore gums most of the work needs to be done on your own at home. Here’s an overview of a typical treatment for sore gums. 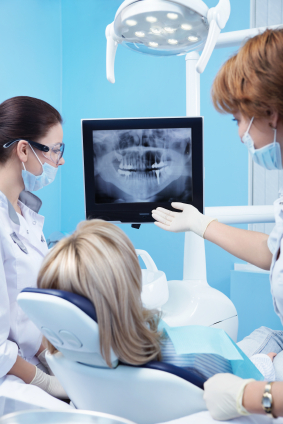 Dental cleanings remove existing bacteria, plaque and tartar on your teeth and under the gums. Eliminating bacteria allows you to start from scratch with a clean mouth so you can prevent further infections and reverse the swelling you are currently experiencing. A cleaning usually costs under $100 for traditional prophylaxis, but deep cleanings for gum disease may cost several hundred dollars. Topical use of prescription-strength mouthwash such as chlorhexidine can help alleviate initial gum swelling and infection, however, extended use can cause significant tooth staining. (3) Be aware that the alcohol in mouthwash such as this one will actually dry out the mouth and can contribute to harmful bacterial growth in the long run. Rinses usually cost around $15 and are purchased at your dentist or available for a call-in to the pharmacy. Ibuprofen is an anti-inflammatory drug that can help alleviate soreness throughout the body, including gums. In cases of severe soreness due to infection, your dentist may prescribe an antibiotic. Most medication is available for a few dollars up to $20 for insurance co-payments. Even though it may seem like you’re hurting your gums by brushing and flossing them more, dedicated home care on a more frequent basis eliminates most factors that cause sore gums. Angle your brush toward the gumlines when you brush, and be sure that you are flossing under the gums against each tooth. An unbalanced diet can make it more difficult for your body to naturally fight infection. Eat plenty of fresh fruits and vegetables and avoid acidic or sugary foods that can feed bacteria. Be sure you’re getting plenty of vitamins and minerals, taking supplements as needed. Avoid sugar, alcohol, smoking and processed foods. Here are some more things to know about oral health nutrition. When applied to the gums or used as a mouth rinse, 100% pure essential oils can help destroy the harmful bacteria that can lead to problems such as sore or swollen gums. Essential oils are often ingredients in over-the-counter mouth rinses, but commercial rinses typically include alcohol, which can cause stinging and dry mouth, which can contribute to more bacteria growth. Sore gums are usually caused by bacteria. Treat them appropriately. Sore gums are typically caused by bacteria in the mouth, which cause gum inflammation, redness, swelling, and soreness. Early on this is known as gingivitis, but it can develop into serious gum disease. Because sore gums are usually related to gum infections you should treat sore gums the same way that you would when you’re treating gingivitis. Kill the bad bacteria that cause problems like sore gums – Click Here. My gums are sore. What should I do? Gently brush your gums thoroughly every day, including flossing under the gumlines between your teeth to remove bacteria. Consider using a topical antiseptic like essential oils or mouthwash that will aid in destroying the bacteria that is causing the soreness. Brushing and flossing make my gums hurt worse. Do I still have to do it? Yes! If you had a wound on another part of the body that was not cleaned thoroughly it would become infected and sore. As you begin to clean these areas of infection, the soreness will gradually go away. Give it time. What can I put on my gums to make them not hurt so much? Rinsing with warm salt water can help alleviate some soreness, as well as taking ibuprofen. Topical ointments available over the counter can provide temporary relief. The best treatment is to have rigid oral hygiene with an added natural antiseptic to the area. Chronic soreness should not be ignored. Can sore gums go away by themselves? No. Neglecting additional care for sore gums will just result in further soreness from complex dental or gum infections. These typically progress into severe gum disease and do not repair themselves. Can I treat my sore gums on my own? Yes. Mild to moderately sore gums can usually be treated on your own at home. Severely sore gums require professional intervention as well – such as dental cleanings – but your hygienist will still recommend the majority of the treatment be done on your own at home on a daily basis. I’m experiencing sore gums during pregnancy. Is this normal? This is very normal. During pregnancy, a woman’s hormone levels can fluctuate and cause some swelling in the gums, which may be sore. It’s important to treat any gum infections during pregnancy, as gum disease can be associated with premature labor and low birth weight babies. February Is National Children’s Dental Health Month; American Dental Association; 2009. Upietrokovski, J., Levy, F., Azuelos, J., Tau, S., Tamari I., Mostavoy, R.; Oral Findings In Elderly Nursing Home Residents In Selected Countries. 2. Soft Tissue Lesions And Denture Wearing Habits; Gerodontology; 1990 Autumn;9(3):75-81. Najafi, MH., Taheri, M., Mokhtari MR., Forouzanfar, A., Fazari, F., Mirzaee, M., Ebrahiminik, Z., Mehrara, R.,; Comparative Study Of 0.2% And 0.12% Digluconate Chlorhexidine Mouth Rinses On The Level Of Dental Staining And Gingival Indices. ; Dent Res J (Isfahan); 2012 May;9(3):305-8. Cortelli, JR., Cogo, K., Aquino, DR., Cortelli, SC., Ricci-Nittel, D., Zhang, P., Aruojo, MW. ; Validation Of The Anti-Bacteremic Efficacy Of An Essential Oil Rinse In A Brazilian Population: A Cross-Over Study. ; Braz Oral Res. ; 2012 Sep-Oct;26(5):478:84. Sharon has been a Registered Dental Hygienist since 2001. She also holds a Bachelor of Science degree in Human Relations and Business. In 2011, she began implementing her dental knowledge into freelance writing services that aided dentists, product designers, continuing education providers, and web marketing firms for their online and distribution purposes. She has since bridged her services into the medical and cosmetic surgery fields.